Hednesford Town suffered just their second league defeat of the season after losing 1-0 in a tight affair at Brackley Town, writes Scott Smith. Before the game The Pitmen were boosted when both captain Darren Campion and influential midfielder Jamey Osborne passed late fitness tests in order to take their place in the starting line-up, despite some concerns beforehand. 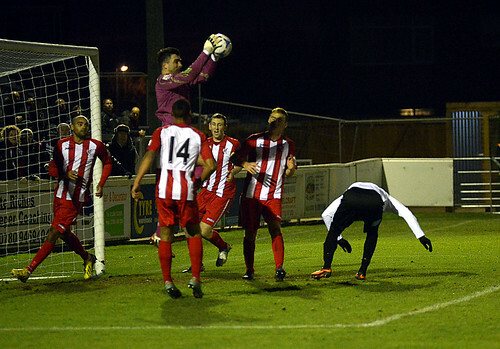 It would be the home side that would start marginally the better and they nearly took an early lead when in the eighth minute Brett Solkhon was denied by a fantastic reaction save from Dan Crane in the Hednesford goal. Back came the visitors though and following good link-up play between the Pitmen front two, Neil Harvey managed to fashion a half chance for Michael Lennon, who saw his low driven effort easily saved by the Brackley goalkeeper Billy Turley. The shot stopper was soon in action again as in the 37th minute he moved sharply across his goal to punch Elliott Durrell’s free kick to safety, with both Francino Francis and Harvey lurking in the six-yard box. Two minutes before the break Hednesford were indebted to Crane for keeping the scores level as he made a brilliant double save to deny Eddie Odhiambo after the Pitmen had been caught out trying to launch another attack. Half-time saw Alex Melbourne replacing the concussed John Disney at the back, after the defender had been caught in an earlier challenge. 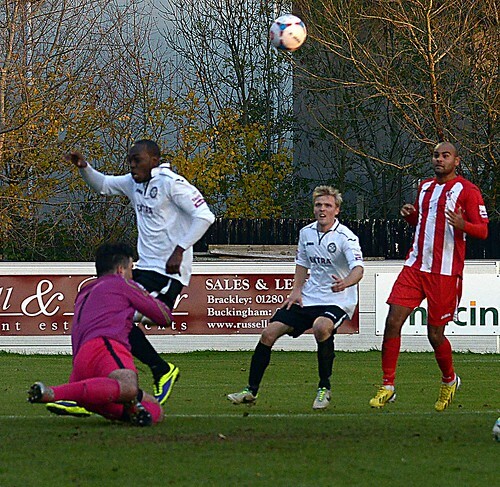 The second period really saw Hednesford come out with positive intent from the start as they looked to edge ahead. First Durrell pulled a snap shot all the way across the goal before his whipped ball in saw Tom Thorley fail to connect at the back post with the goal at his mercy. The Pitmen were now really on top; however they failed to really threaten Turley in the Brackley goal again, despite having the home side well and truly on the back foot. 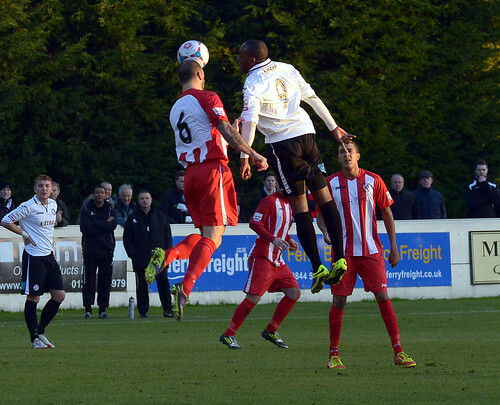 Following the introduction of the lively Izak Reid, the home side came back at Hednesford with real vengeance. 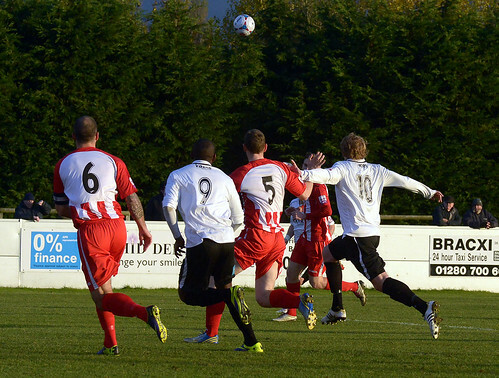 Following a succession of corners, Brackley almost took the lead in the 76th minute as Steve Diggin robbed Ben Bailey of possession and after cutting back from the by-line his driven effort hit the crossbar. Hednesford were now really struggling to get out of their own half and in a rare foray forward Harvey blazed high and wide as the visitors tried to take the pressure off their defence. 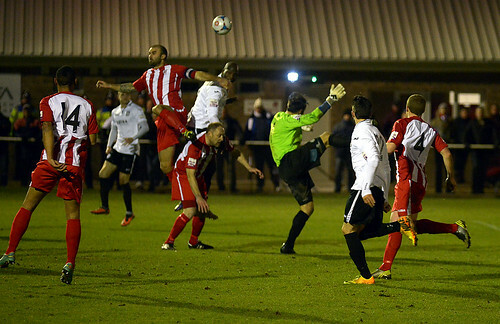 This would only delay the inevitable though, as following another period of concerted pressure Brackley found the breakthrough in the 86th minute. The lively Reid pushed the ball past Campion and his cross in was superbly nodded home into the far corner of the net by Diggin. It was a goal that had been coming, however Hednesford still managed to come back at their hosts, but despite forcing a number of set-pieces they failed to really threaten the home side’s goal. In the end the one goal would be enough to sentence The Pitmen to their first league defeat since the 7th September; however it wouldn’t displace them from the top of the table, with the top six now being separated by just one point. Hednesford can now look forward to a break from league action as cup competitions take priority over the course of the next two weeks.